A savory trout dish perfect for hearty brunches or dinners. Trout fillets are dredged in flour and egg, before being coated in a layer of zesty Parmesan cheese and fried. 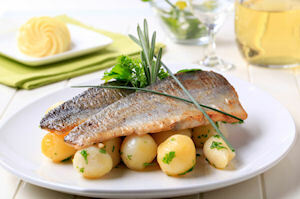 Creamy and tangy hollandaise sauce tops the trout, creating a medley of unforgettable flavors. This delicious dish is suprisingly easy to prepare, and goes well with salad, hash browns, or any other side dish. In large Dutch oven heat 1-2 cups of vegetable oil to 375 degrees F.
In small bowl beat 4 eggs with 2 Tbsp water until light and fluffy. Set aside. Place flour, salt and pepper in shallow baking dish. Wash and pat the trout dry, and dredge in flour to coat. Dip trout into egg wash and pat with Parmesan on all sides, until entire fish is coated. Set aside; repeat until all trout fillets are dredged and prepared. Set aside. Prepare Hollandaise sauce: in blender combine lemon juice, egg yolks, and salt on high speed. Drizzle in hot butter until mixture is thick. Add cayenne. Set aside until ready to serve, pulsing in blender before serving. Fry trout for 5-6 minutes in hot oil until golden brown. Serve topped with Hollandaise sauce. Ok I don't mean to toot my own horn but my Parmesan Trout tasted like the same dish at Clydes and Old Ebbit Grill in the Washington DC area! It came out perfect. I think I missed my calling at a Chef! Trout? Even my wife and 10 year old daughter ate this. A must try dish. Tasted amazing. Summary: A savory trout dish perfect for hearty brunches or dinners. Trout fillets are dredged in flour and egg, before being coated in a layer of zesty Parmesan cheese and fried. Creamy and tangy hollandaise sauce tops the trout, creating a medley of unforgettable flavors. This delicious dish is suprisingly easy to prepare, and goes well with salad, hash browns, or any other side dish.